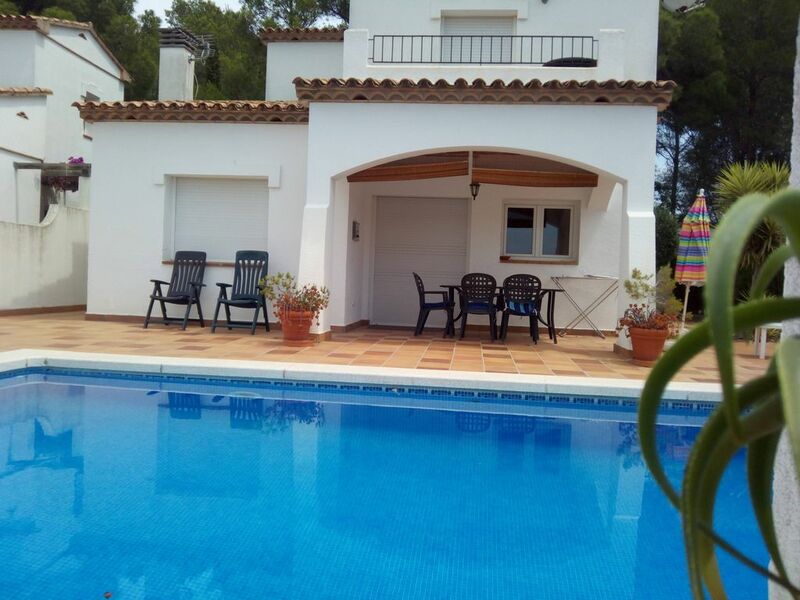 Casa Bonita is located in the area of Riells in the beautiful Costa Brava village of L'Escala. The property is in a small community of 11 private villas with their own pools, which is ideal for groups or families holidaying together who want their own space. Villas are set over two floors with the main living area on the ground floor with kitchen and dining area. A bedroom with twin beds is located on this floor as is the shower room and w/c, utility at rear. The upper floor has two bedrooms, one with twin single beds and the other room a king size bed with veranda overlooking the pool. There is also a bathroom upstairs. It has ashower and WC. There is Air-Con in the Lounge and Master Bedroom. Outside a private pool is located in a private garden with terraces and a shaded area at the rear & BBQ. The beach of Riells is located at about 15 min. Opposite to the beach are numerous bars and restaurants. About L'Escala : In summer the town becomes bustling but not at all rowdy. The absence of any high-rise buildings gives it a bright and friendly atmosphere. Its geographical position makes it an ideal base for travelling further a field. Swimming pool and spa opening soon!! Nearby Figures was home to the famous artist Salvador Dali. Then there are the 'Villages Typiques' just north of the border near Perpignan. To the south there is the provincial capital of Gerona and the capital of Catalonia - Barcelona. To the west is the lake at Banyoles, Ripoll, duty free Andorra and the snow-capped Pyrenees with skiing for many months of the year. 2km north lays the walled medieval village of St. Marti with its pleasant Plaza Major, many bistros and pretty church and museum. There are several top Golf Clubs within 30 min. drive, a lover 1hr30 Min drive brings you to a popular but not crowded ski resort and for the less adventurous of us tobogganing you are also able to snow board here and have lessons. For your convenience: Taxis to and from Airports or stations can be arranged. Car hire can also be arranged. Cleaning before arrival is included in the price. Maid service extra (please email for price) smoking allowed outside of the villa ashtrays provided. Having been going to L'Escala for 40+ years and staying in many different villas this is one of my favourite, the villa itself is very comfortable and well looked after. The location is perfect for us with only a 10-15 min walk to shops, beach and restaurants, loved our stay there and look forward to going back next year. We work hard to ensure that our guests enjoy our properties. Thanks for your visit. we found the villa really good and well equipped and Steve was very welcoming and helpful. I would definitely recommend to others. Casa Bonita II - an excellent choice! We keep returning here (4th visit this year) mainly because we know that Casa Bonita properties have everything we want from a holiday. It is almost a home from home. The houses are very clean and well-equipped, with a plentiful supply of freshly laundered towels and linen. The pool and surrounding area is very clean and well maintained. Steve is always charming and friendly and we would highly recommend Casa Bonita II to anyone visiting the area. L'Escala is lovely, with clean beaches and some nice restaurants. I would suggest taking care with the 'cocktail bars' - the mojitos are of variable quality! For a special occasion meal we recommend trying one of the lovely fish restaurants near the marina. It is more expensive here but the quality of the food is very good and the service is excellent. It is always nice to welcome back guests who have stayed with us previously. It´s nice to know our hard work is appreciated. A great house, very complete! We had a great time in Casa Bonita! The thing we loved most I guess is that when you book for 6 persons in Spain, they actually fit in! It is spacy, has 2 good bathrooms, more than enough closets!!! and a lovely pool. The only shame was that they could have done more with the garden. Some grass would have been nice. And maybe an extra table at the back of the house, because in the sun is too hot to have dinner (with young children we Dutch people eat early when the sun is still hot!). What a lovely surprise it was to find out that there is a great forrest just 3 streets away. I had the best walks early morning with the dog. All in all, a great location, nice village, beautiful nice house, and they really do make you feel very welcome! Thanks! Many Thanks for the great Review !! For anyone interested in Dali and his life and works, there are plenty of interesting trips including the Dali Museum at Figueres. We suggest you visit early evening when the queues are shorter There are also other beaches not too far away, including L'Estartit where you can enjoy a boat trip. The old town of Girona is also worth a visit, particularly the cathedral. We would definitely recommend the property as we received excellent customer service and would certainly return there again. We took a teenager with us and she was never bored! The lovely Spanish seaside town of L'Escala is situated on the Mediterranean in the bay of Roses, it's beautiful beaches make it an ideal place for family holidays, it is both a working town and a tourist resort, the old town is very traditional with it's maze of narrow streets filled with shops, cafes, bars and restaurants. There are plenty of nearby places to visit, figures with the Museum of the famous artist Salvador Dali, the cultural city of Girona, La Bisbal which is famous for it's ceramics, the lovely moated medieval village of Peratallada and the fantastic city of Barcelona 140km away. Empuries boasts the extensive Greco Roman ruins and the small village of St. Marti is just wonderful with it's plaza of restaurants and pretty church. L'Escala offers plenty of activities and water sports to suit all ages. ARRIVAL AND DEPARTURE TIMES Properties are available from 16:00 hrs on the day of arrival. If you arrive before that time you can contact us to see if the property will be available earlier than 16:00 Properties are required to be vacated at 10:00 hrs on the day of departure. PROPERTY CONDITION & CLEANLINESS You will find our property clean and in good order on arrival. You must therefore leave it clean and in good order, at the end of your stay. The property that you have rented is a privately owned property. It represents a considerable financial investment and in some cases is the owners own home. We ask you to be mindful of this during your stay and to treat the property and its contents with care and respect. On arrival, If you find a problem with the property or its contents, YOU must report this to us as soonas possible or you may be held responsible. DEPOSIT/BOND The mandatory security/cleaning bond of €200 Euros is not included in the rental price. This will be added to the invoice during or after the initial reservation request. You will need to pay the bond within the normal payment conditions, The bond will be refunded within 7 working days of departure by bank transfer/Credit Card or PayPal and provided the property is in good condition and clean and /or deducting the expenses in case of repair or replacement of broken items ,damaged or missing and extra hours of cleaning. You are responsible for damages that exceed the amount of the €200 Euros bond . We advise you to contact us in case of damages which you caused. Any additional cleaning required as a result of the property not being left in good order will be charged at €25 Euros per hour and will be deducted from the Bond Payment.